The Latinx Theatre Commons (LTC) convened in Seattle for three days in April 2016 to solidify Latinx theatre ties in the Pacific Northwest (PNW). Formed in 2012, the LTC established “a national meeting to connect the many vibrant conversations happening all over the nation and set the stage for what Latina/o artists want and need in the American Theater” (Zacarías). The national movement, in partnership with HowlRound, hopes to transform the American theatre narrative by raising the visibility of Latinx artistry through a four-pronged approach: advocacy, art-making, convening, and scholarship. Its growing sixty-plus-member Steering Committee is comprised of theatre practitioners, administrators, scholars, and allies who volunteer their time and labor in multiple capacities. In addition to regional convenings like the one held in Seattle, other LTC initiatives include the institution of Café Onda, an online journal furthering national conversations surrounding Latinx theatre, the Los Angeles Theatre Center’s 2014 Encuentro: A National Latina/o Theatre Festival, and the 2015 LTC Carnaval of New Latina/o Works, hosted by the Theatre School of DePaul University in Chicago. These initiatives, paired with other smaller regional convenings, create a mobile, collaborative network that illuminates, challenges, and redefines American theatre through the presence of an active Latinx theatre collective. For the April 2016 event, LTC’s Steering Committee was joined by a host of PNW and British Columbian theatre artists and scholars enthusiastic to engage in the first regional dialogue of its kind. 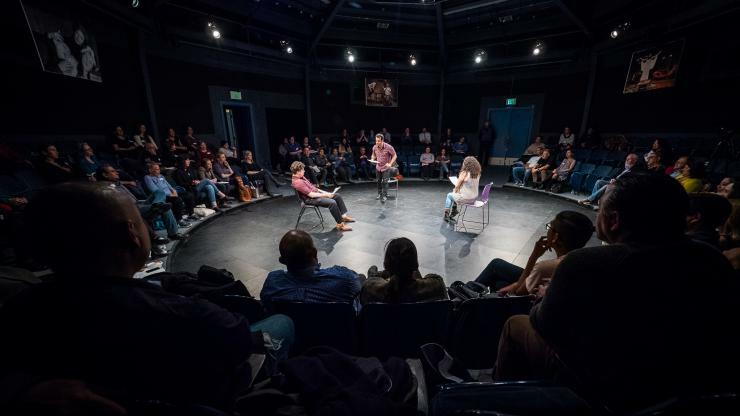 Held at the University of Washington’s School of Drama, the convening was the culmination of a multiyear effort to bring Steering Committee to an area of the country where Latinx theatre achievements have often been invisible. The weekend featured our own dramaturgical presentation that contextualized the history of Latinx theatre in the PNW on the first night, interactive conversations among local, regional, and national artists on the second day, and the planning of regional collaborations on the last day. The convening’s goal to cultivate a national community of Latinx theatre-makers by sharing knowledge in intimate, face-to-face conversations brought together dedicated individuals from across the nation and created new artistic connections among the region’s diverse artists. The Friday-night inaugural ceremony took place in the historic Glenn Hughes Penthouse Theatre on the University of Washington campus. The program was designed to provide the Steering Committee members (many of whom were unfamiliar with the Latinx theatre scene in the PNW) with a clear look at both the past and present of the vibrant artistic community. After drinks and live music, School of Drama executive director Todd London gave opening remarks, followed by a proclamation from the Seattle mayor’s office announcing April 15th as “Latina/o Theatre Day” in the city. This was followed by our five-minute dramaturgical presentations of seminal moments from Latinx theatre companies in the PNW interspersed between scenes from four plays by María Irene Fornés, directed and performed by some of the top Latinx talent in the region. Both the overview of selected theatre companies and the inclusion of Fornés’s legacy in Seattle in our dramaturgy were meant to highlight the breadth and scope of Latinx theatre in the region. The Seattle convening was important to the artists of the PNW because it was a reminder of the oft-forgotten legacy of Latinx theatre in the region. Throughout the weekend, specifically on the first night of the convening, our goal was to contextualize for the participants the rich history of its teatros and artists dating back to the 1970s. Our opening night dramaturgical presentation featured the history of key theatre companies, as well as an installation of vintage posters and a slide show in the theatre’s main lobby. A largely forgotten theatre company we touched on was one of the first guerrilla-style theatre groups in the PNW, Teatro del Piojo. Formed in 1970 by Tomás Ybarra-Frausto and Elda Cisneros Mendoza at the University of Washington, the company performed throughout Washington, Oregon, Idaho, and Utah in campos, community halls, picket lines, prisons, and universities. Attendees at the convening learned that the theatre’s distinctive name, Teatro del Piojo (theatre of the lice), stemmed from the degrading process experienced by Chicano children of having teachers search their hair for lice before class began. The group “chose this symbol as a base upon which to build something better. From a negative image of the past, something positive will arise; from whatever bad things spoken about them, they will create something good” (Martinez and Martinez). Many attendees at the convening were surprised to learn about Teatro del Piojo’s accomplishments, as well as the social conditions surrounding the formation of the group. During the opening night ceremonies we framed the history of Teatro del Piojo in relation to the histories of The Group Theatre, Teatro Latino, Milagro Theatre, Oregon Shakespeare Festival (OSF), eSe Teatro, and Latino Theater Projects. As local scholars we were compelled to detail each of these PNW theatre’s contributions to remember and celebrate their presence within the larger history of US Latinx theatre. This effort was also to honor the artists involved, many of whom were in attendance at the convening. For example, The Group Theatre, cofounded by Ruben Sierra in 1978, was the first multicultural theatre in Seattle. For twenty years (1978–98) it produced critically acclaimed work and enabled local audiences to see for the first time plays like Marisol, Real Women Have Curves, and Roosters. The large number of Latinx actors and directors assembled by The Group Theatre’s formation led to the emergence of another theatre company, Teatro Latino. This was a grassroots company that produced not only plays, but also ritualistic performances that incorporated archetypes and poetry—a practice that ultimately led to Seattle’s now annual Día de los Muertos celebration. Teatro Latino’s crowning achievement was the creation of a bilingual children’s show that toured regional libraries, where hundreds of children saw their first theatricalized tales from Latin America. 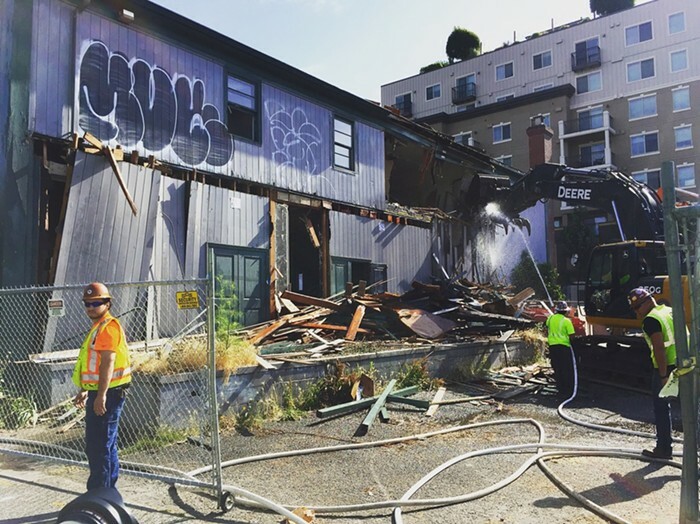 Veteran Seattle actor Jose Carillo described this “labor of love” as a community-engaged effort intended to “tear down the temple” of the bureaucratic establishments that ran the commercialized regional theatres (Carillo, personal interview). The Group Theatre and Teatro Latino were discussed at length during the presentation, and pictures of their early productions were included among the lobby displays in order to contextualize each company’s contributions to Seattle Latinx theatre during the 1980s and ’90s. Oregon-based companies Teatro Milagro and OSF and Washington-based eSe Teatro and Latino Theater Projects were also included in our dramaturgical presentation to showcase how present-day, larger and smaller companies are producing Latinx-based work and growing its audiences throughout the PNW. Teatro Milagro, aka Miracle Theatre, was detailed from its 1985 formation by husband and wife team José González and Dañel Malán in which a homesick González decided, “Well, if I can’t go back home there [to Texas], then maybe I can bring home here [to Portland]” (González, personal interview). The result has been a thirty-one-year artistic endeavor that has united the Latinx artistic community in Portland, with actor-training workshops, touring groups, and full- length Spanish-language productions being prominent successes of Teatro Milagro. OSF was honored as an ally and active producer of Latinx work, despite not being labeled a “Latinx” theatre company. During the last ten years and under the leadership of artistic director Bill Rausch, the company has produced a good number of Latinx-authored plays, five of them being world premieres. OSF has also implemented the Latino Play Project to cultivate Latinx playwrights and showcase new plays. As described by OSF’s associate artistic director Christopher Acebo, the company employs a “matrix of color-conscious and racially open-casting practices that are thoughtfully and sensitively considered for each production” (Acebo, personal interview). During the convening, both Milagro and OSF were highlighted as large-scale theatre organizations that are successfully building Latinx audiences in a region where Latinx populations have often been neglected. Our live, opening night dramaturgy also celebrated the more recent development of contemporary Seattle theatre companies eSe Teatro and Latino Theater Projects. Founded in 2010, eSe Teatro has produced a multicultural playwrights’ festival, as well as playwriting and acting workshops. Mainstage productions include Oedipus El Rey, Don Quixote and Sancho Panza: Homeless in Seattle, and most recently the critically acclaimed Bernie’s Apartment (an adaptation of Federico García Lorca’s The House of Bernarda Alba). The Latino Theater Projects, founded in 2011 by Fernando Luna and Robert Harkins, engages in a wide variety of community-centered projects, including arts instruction to low-income elementary students, and has staged numerous mainstage productions, including Death and the Maiden, Anna in the Tropics, and most recently Mariela in the Desert. Artists currently associated with Latino Theater Projects and eSe Teatro, along with the previously mentioned theatre companies, were showcased during the opening night presentation to remind conveners of the foundations of Latinx theatre in the PNW that have been laid over the previous forty-five years. As presenters we also acknowledged that the companies and artists discussed in the presentation did not include everyone who has contributed to Latinx theatre in the PNW. However, we felt that showcasing the selected companies and artists could serve as a prism for revisiting this legacy, as well as a motivating tool for local and regional participants to continue building on this history. In addition to our historical overview of key theatre companies in the PNW, the inclusion of Fornés as part of the opening night was critical. Like the overlooked contributions of PNW Latinx theatre companies within the larger scope of Latinx theatre in the United States, the Obie Award– winning playwright’s extensive work in Seattle during the 1980s and ’90s has been little noted by Fornés scholars. As an attempt to address this gap in knowledge, four short scenes (ten minutes each) from her plays produced in the region were performed by area artists as a window into the PNW’s intimate connection to the “grand dame” of US Latinx theatre. Through brief introductions, the scenes were contextualized with details of each historical PNW production, many in which Fornés was directly involved. Next on the bill was Rose Cano’s Spanish-language translation of Fornés’s play Mud (Barro), emphasizing the talents of bilingual theatre artists of the region. Also directed by Cano, the scene featured the dynamic local performers Fernando Cavallo, Marco Voli, and Sophie Franco. Prior to the performance, the details of Cano’s inspiration for translating the play were revealed. Cano, who is the artistic director of eSe Teatro, first met Fornés in 1984 when the playwright staged a work- shop production of Abingdon Square at the Seattle Repertory Theatre. Originally from Peru, Cano wanted a Spanish translation of Mud because she thought the play’s themes would fit the realities of class divisions between the urban and rural communities in her home country. She first translated the play into Spanish in 1990, and it was staged at the first Young Director’s Festival in Lima. Additionally, Cano’s own personal remembrances of Fornés provided insight into the ways that Mud has sometimes been misinterpreted. She remembered a teleconference with the playwright in which journalists asked Fornés if she was thinking of her native Cuba when she wrote Mud. Cano recalls the playwright emphatically saying “No. It’s not about Cuba. It’s about Appalachia” (Cano, personal interview). Fornés’s exploration of Appalachian identity demonstrates her ability to tell stories of non-Latinx cultures in an accessible and universal way. From Cano’s own perspective, Barro signified the connection between North and South, and she saw the play as an artistic exchange between her own two hemispheres. As a result, Cano’s interactions with Fornés and the process of working on Barro were greatly influential to her own approach with eSe Teatro. The dramaturgical presentation also highlighted Seattle’s reception of Fornés. In 1991 the relationship between her and New City was commemorated with a public ceremony: the two cherry trees outside the old New City Theatre building on Seattle’s Capitol Hill were dedicated to Irene’s mother Carmen on her 100th birthday. 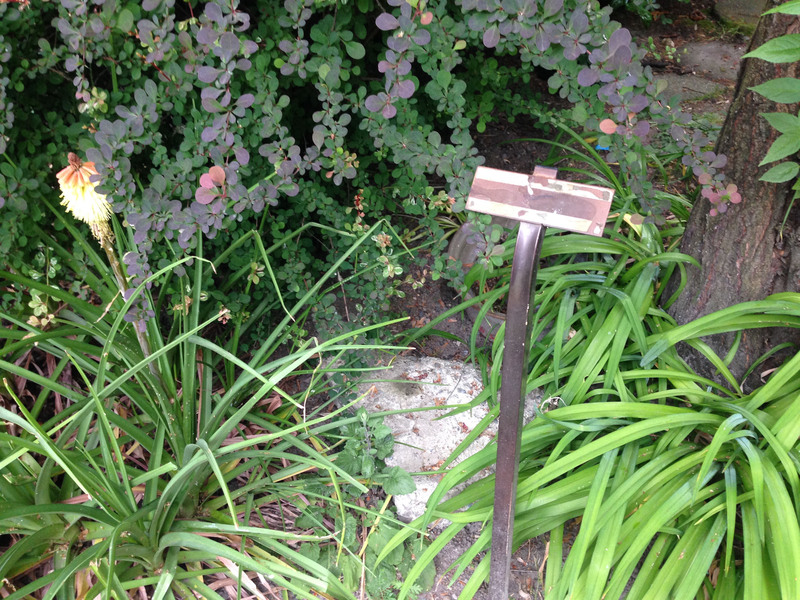 The commemorative bronze plaques were meant to “serve as permanent reminders to the Puget Sound community of Fornés’ special interest in and unique influence of theater in this area” (Ludlum). However, the plaques and the cherry trees are now gone, as the old theatre where Fornés regularly worked was demolished in June 2016. We included this fact in the presentation to call attention to the very real dangers of the forgetting and erasure of local histories, especially in a city currently being refashioned by globalization. The final scene of the night was Letters from Cuba (2000), directed by Latino Theatre Projects artistic director Fernando Luna and performed by Erwin Galán. The critically acclaimed play has yet to be staged in the PNW, but was presented as a celebration of Fornés’s final work. Recognized for its poetic imagery, the bilingual scene from Letters from Cuba emphasized the touching simplicity and haunting aesthetic that permeates so many of her plays. Galán, known locally for his portrayal of Oedipus in eSe Teatro’s 2012 production of Luís Alfaro’s Oedipus El Rey, wowed the audience with his high-energy, off-book, bilingual solo performance. The culminated energy from the opening night’s dynamic performances, mixed with the unveiling of the region’s rich and understudied history of Latinx theatre, created a sense of community and purpose that carried us into the remainder of the weekend. LTC’s Steering Committee had been invited to Seattle to show that, in the PNW, the movement is strong. By the end of the opening night we had successfully put ourselves on the map. The first gathering of Saturday was initiated by documenting the challenges and opportunities experienced by Latina/o artists in the region. Moderated by Diane Rodriguez (National Council on the Arts) and Kinan Valdez (El Teatro Campesino), the discussion was circular: twelve chairs were placed center stage in the Hughes Penthouse Theatre, creating an inner ring surrounded by the in- the-round seats of the theatre. Participants who chose to sit in one of the twelve chairs could offer their observations on the conditions of theatre-making in the PNW or respond to the comments of others, while the remaining attendees sat in the outer theatre seats and quietly observed. If someone from the outer circle wanted to add their voice, they would tap on the shoulder of a participant seated in the inner circle, thus replacing them and keeping the conversation dynamic. Likewise, if someone seated in the inner circle felt finished, they could leave the circle voluntarily. This communal dynamic attempted to create a conversation that was nonhierarchical, detached from the concept of leaders and allowing for the maximization of diverse voices. This format had previously been used in the 2015 Dallas regional convening; here in Seattle it allowed for the involvement of PNW artists with a variety of professional experiences and understandings of the area. By the end of the session, each of the twelve chairs had been occupied by at least two PNW artists vocalizing their successes and concerns, lending to a vibrant conversation. The topics covered (and documented by Valdez on a white board so as to create a “map” of ideas) were issues specific to Latinx theatres in the region, and included access (or lack thereof) to funding, space, and “trained” actors. During the session these regional artists also expressed a need to make allies, not only with established theatre companies outside of the Latinx paradigm, but also with other artists within it. As a result, connections were made during the convening among the Seattle-, Portland-, and Vancouver-based artists. The inclusion of artists from Teatro Puente in Victoria, British Columbia, was significant because it heightened the awareness of Latinx artists north of the border, and how the forty-ninth parallel prohibits the coming together of like-minded theatre-makers. One attendee from Victoria, which is ninety minutes north of Seattle, expressed her feelings of isolation as a Latina artist and the invisibility of her region as a producer of Latinx theatre. The circle exercise allowed participants to share their challenges of being a Latinx artist in the PNW, and the feeling of disconnection was a shared sentiment among a majority of the regional artists. By the time the last session began, the energy between participants had a distinctly different quality. Attendees had witnessed the celebration of PNW Latinx theatre history and talent during the Friday evening ceremonies, contributed to the Saturday morning breakout session, and enjoyed Saturday evening festivities with a performance of Brownsville song (b-side for tray) at the Seattle Rep, directed by LTC member Juliette Carillo. Those who walked back into the Hughes Penthouse Theatre on Sunday afternoon were to varying degrees inspired, motivated, and exhausted. Many LTC Steering Committee members from other parts of the country left that morning, leaving behind a smaller, intimate group of approximately twenty-five people, comprised primarily of those from the PNW region. Like the Saturday session, the last gathering was tailored to the needs of the PNW theatre community. Co-led by Abigail Vega (LTC’s producer) and Maria Enriquez (Steering Committee), it began with an informal introduction of everyone in attendance. 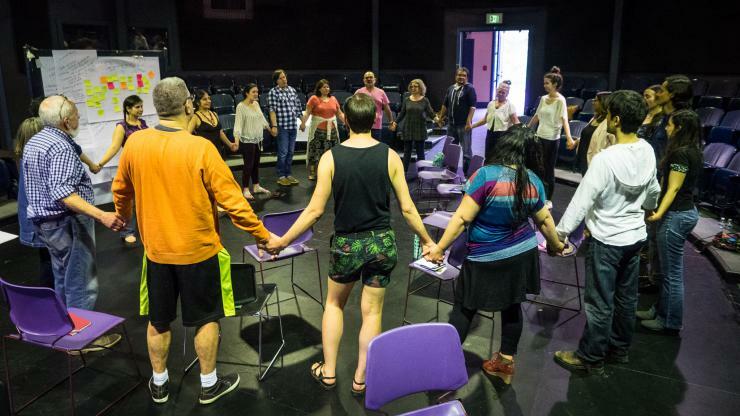 The group once again formed a circle—a symbol frequently evoked among Steering Committee members to metaphorically describe the circular widening and deepening of the Latinx theatre community. This last session was meant to do just that: strengthen the newly developing regional ties of the PNW Latinx theatre collective. After the introductions, participants revisited the challenges/opportunities discussed on the previous day and shared fresh insights into what had already been expressed. A communication net- work for regional practitioners to share their upcoming projects was recognized as a critical absence. Another sentiment reiterated by multiple participants was the need and desire to feel empowered moving forward. This echoed Rodriguez’s statements from the Saturday session that discouraged Latinas/os from embracing a victim mentality. Instead, the charge was to remember one’s own agency in creating opportunities through the production of new artistic work. This focus on self-empowerment organically transitioned the Sunday afternoon discussion from challenges to intervening actions. The brainstorming of solutions came about in two different exercises. The first was a musical chair–style activity that allowed participants to converse one-on-one about what an ideal theatre situation in their local or regional community would look like, and how they could intervene to any of the affirmed challenges. The second exercise divided participants into small groups of their choice to tackle one of four topics: documentation; show up (community-building); inclusion of Indigenous voices; and bridging the region/borders. Both activities began the process of generating multiple solutions to previously identified problems, and also allowed individual connections to happen. As a result, individual, local, regional, and transnational commitments arose focusing on one of the four areas. To remedy the absence of documentation of Latinx theatre in the PNW, some participants committed to write a blog, production review, or article every three months. As a way of supporting fellow artists, individual pledges were made to attend productions by local Latinx companies, and to arrange group trips to support companies within a few hours of one another. Also, the Facebook group “NW Latina/os Show Up” was created to keep the community connected online. A final initiative to increase collaborations among individual artists and companies resulted in a particularly inspired idea brainstormed by artistic directors Cano and Mercedes Bátiz-Benét (Teatro Puente). These theatre practitioners aspired to bridge Latinx identities across the Americas and erase national borders through a new project called Readings Crossing Borders. The artistic endeavor would produce staged, bilingual readings on the international ferry ride between Seattle and Victoria, in waters that have been the center of national boundary disputes between the United States and Canada. The trisection of United States, Latin American, and Canadian national and ethnic identities touched on by Readings Crossing Borders would stage and make visible a unique performance of, in, and by the Americas. (Cano, a US citizen, originates from Peru; and Bátiz-Benét, a Canadian citizen, was born and raised in Mexico.) In its initial phase of development the Reading Crossing Borders project, along with the other initiatives that grew out of the regional convening, highlights a growing collective of Latinx artists in and surrounding the PNW. During the LTC convening all participants were continually reminded of the artistic legacy of the area, and local and regional artists were encouraged to build alliances that will allow them to create their own tables of opportunities. Maria Enriquez is an artist/scholar, K. Leroy Irvis fellow, and PhD candidate at the University of Pittsburgh. She holds an MFA in performance from Arizona State University, and was an artistic associate with Chicago-based Teatro Luna. Her research interests include US Latinx theatre, critical race theory, and performance and cultural studies. She has presented papers at ATHE, ASTR, IFTR, and MATC. She is an LTC Steering Committee member, an editorial board member for the online journal Etudes, and a faculty member at Penn State Harrisburg. Christopher Goodson is a PhD candidate in theatre history, theory, and criticism at the University of Washington’s (UW) School of Drama, where he is a Graduate School Presidential Dissertation Fellow. As a host committee member of the 2016 LTC Steering Committee convening in Seattle, he presented on the history of Latina/o theatre in the PNW and the Seattle-based work of María Irene Fornés. At UW he has received the Michael Quinn Award for excellence in graduate writing, as well as a recent dissertation research grant from the Harry Bridges Center for Labor Studies. He is currently investigating contemporary, experimental performance that mediates issues of undocu- mented immigration and transnationalism, and teaches theatre history at Cornish College of the Arts in Seattle. Acebo, Christopher. Personal interview with Maria Enriquez. 12 Apr. 2016. Cano, Rose. Personal interview with Maria Enriquez. 5 Apr. 2016. Carillo, Jose. Personal interview with Christopher Goodson. 2 Apr. 2016. Ewald, Mary. Personal interview with Christopher Goodson. 21 Mar. 2016. González, José. Personal interview with Maria Enriquez. 2 Apr. 2016. Gottberg, Ki. Personal interview with Christopher Goodson. 31 Mar. 2016. Ludlum, Anne. “Why Attention to Trees in Richard Hugo House Yard?” 2 May 2001. Unpublished. Martinez, Frank, and Blanca Estela Garza Martinez. “Teatro del Piojo: Un Recorrido Histórico.” Metamorfosis 2.1 (1978): 8–15. Print. Zacarías, Karen. “Foreword” to Brian Eugenio Herrera’s The Latina/o Theatre Commons 2013 National Convening: A Narrative Report. Boston: HowlRound/Emerson College, 2015. Print. Christopher Goodson is a PhD candidate in theatre history, theory, and criticism at the University of Washington’s (UW) School of Drama, where he is a Graduate School Presidential Dissertation Fellow. As a host committee member of the 2016 LTC Steering Committee convening in Seattle, he presented on the history of Latina/o theatre in the PNW and the Seattle-based work of María Irene Fornés. At UW he has received the Michael Quinn Award for excellence in graduate writing, as well as a recent dissertation research grant from the Harry Bridges Center for Labor Studies. He is currently investigating contemporary, experimental performance that mediates issues of undocumented immigration and transnationalism, and teaches theatre history at Cornish College of the Arts in Seattle.